Schematic diagram of manipulation of microparticles with two different sizes by utilizing an optothermally and acoustically excited bubble on-demand. (a) Dispersed microparticles with different sizes. (b) Generation of a bubble through optothermal effects. (c) Transportation of the bubble toward the dispersed microparticles by using optothermocapillary effects. (d) Sorting and capturing of target particles with a specific size by means of acoustic radiation effects. (e) Transportation of captured particles through both optothermocapillary and acoustic radiation effects. (f) Releasing captured particles in the absence of acoustic agitation and subsequent return to the original position by way of optothermocapillary effects. Schematic diagram of a proposed electromagnetically driven on-chip micromanipulator: When a bubble on the tip of the micromanipulator is acoustically excited at its natural frequency by a piezoactuator attached beneath the chip, it oscillates and simultaneously generates a radiation force, called a Bjerknes force, which results in pulling a neighboring object onto its surface, as shown in Fig. 1(b). The captured object can be transported to any location with the micromanipulator actuated by an external magnetic controller consisting of precisely controllable 2D traverse and twin permanent magnets (Fig. 1(c)). When the object carried with the micromanipulator reaches a target location, it can be released from the bubble simply by turning the piezoactuator off and transporting the micromanipulator to the original position, as shown in Fig. 1(d). 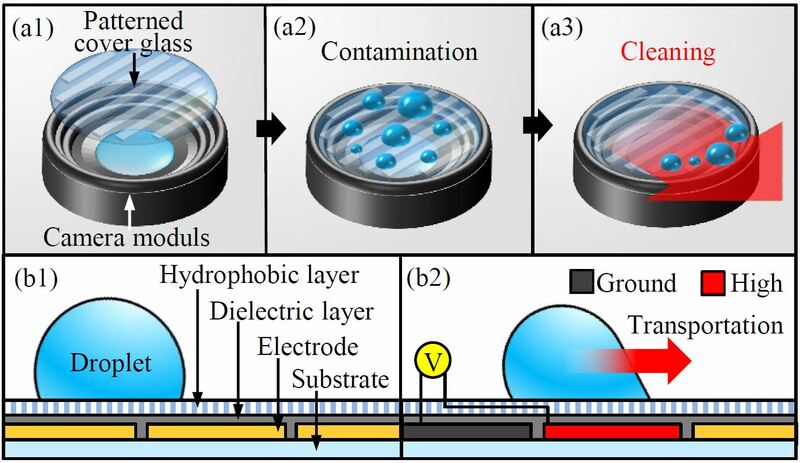 Conceptual schematic of the microfluidic-based magnetic-field-driven manipulation of the liquid metal: (a) coating with Fe particles, (b) HCl treatment and suction of the liquid metal, (c) HCl-treated liquid metal injection into the PDMS-based microfluidic channel filled with HCl or NaOH, and (d) on-demand magnetic manipulation of the HCl-treated liquid metal. 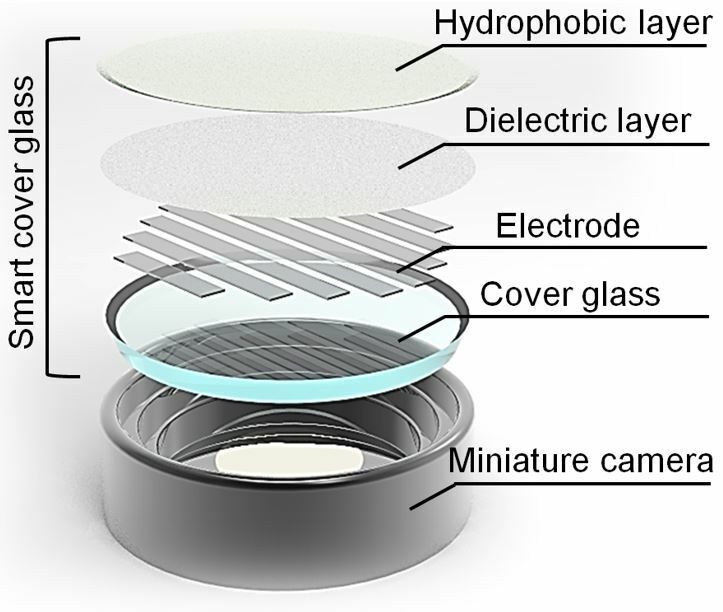 Schematic diagram of a smart self-cleaning lens cover based on an electrowetting (EW) principle for miniature cameras (a-c) and sequential sketches of droplet transportation on coplanar electrodes by EW actuation (d-e). Schematic diagram of a proposed magnetic droplet manipulation system actuated by magnetic actuation and acoustic excitation: (a) top view; (b) side view. Multifunctional liquid lens (MLL) for miniature cameras used in smart devices and biomedical imaging systems has been developed in Myongji University Microsystems Laboratory. MLL firstly offers variable-focus and variable-zoom in a single lens system using two different actuation schemes : electrowetting-on-dielectric (EWOD) actuation for controlling the lens curvature and electromagnetic actuation for controlling the lens position. Schematic diagram of a tunable liquid lens operated by electromagnetic actuation. According to Faraday’s law of electromagnetic induction, when electric current flows in an electric coil, a magnetic field is generated in its surroundings. The magnetic field is used to actuate or pull a ring-shaped neodymium magnet placed on the top of an elastic polydimethylsiloxane (PDMS) membrane in the liquid lens, resulting that the liquid inside an actuation chamber flows into the lens chamber through open walls. It brings the change of the surface profile and focal length of the liquid lens. Schematics of 3D manipulation of a droplet in parallel plates consisting of the patterned arrays of EWOD electrodes: (a) 3D envisioned image; (b) 2D droplet motion images. Schematic diagram of AC-EWOD driven waves on the water surface and flows: (a) At low frequencies (< 1 Hz), oscillating flows with standing waves are generated; (b) At high frequencies (> 50 Hz), steady flows with travelling waves are generated. Conceptual description of the enhancement of electrowetting-on-dielectric (EWOD) response speed based on overdrive method. To improve response time (time to reach base radius (rb1), an overdrive voltage (V2) exceeding the target voltage (V1) is initially applied for the first frame (t1), and the target voltage (V1) is then applied for subsequent frames. This results in a reduction of the response time (t2-t1). An acoustically oscillating droplet induced motion-powered energy harvester: (a) When a water droplet is acoustically excited by a piezoactuator around its natural frequency, it oscillates; (b) When an acoustically oscillating droplet is placed on the tip end of a piezocantilever, the oscillating motion of the droplet induces the continuous bending of the piezocantilever as the reaction, resulting in electric power generation from the piezocantilever. The envisioned energy harvesting system can extract mechanical power from acoustic noise over a wide range of frequencies using liquid droplets with different sizes and natural frequencies and convert the mechanical power to electrical power for wireless electronic devices. This new type of actuation technique is a simple but useful tool not only for energy harvesting systems but also for potential acoustic wave sensors and actuators in the future. Schematic diagram of a tunable optical iris operated by electromagnetic actuation: When an electrical current is applied to an electric coil, a ferrofluid initially filled inside the sub-channel of the iris is electromagnetically actuated and pulled to the center of the main channel, resulting in changing the aperture of the iris. Schematic diagram of micro-object manipulation in blood vessels using a microrobot incorporated with an acoustically oscillating bubble: (a) Test setup; (b1–b3) Micro-object manipulation in human blood vessels using the designed microrobot. 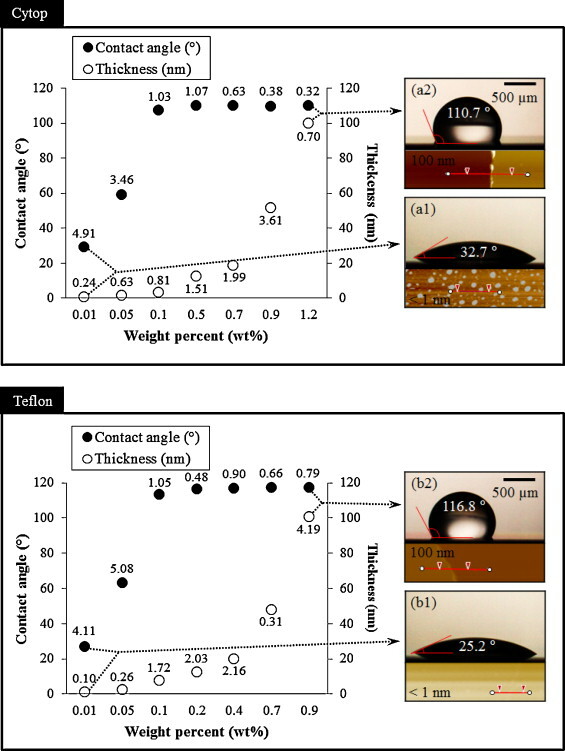 Contact angles of water droplets and thicknesses of thin layers with respect to weight percentages (wt%) of Cytop and Teflon. Note that the number near each data indicates the standard deviation. Streamlines and velocity contours of steady streaming flow around a sessile bubble actuated by an acoustic wave: (a) PIV experimental result and (b) computational result. Micro-object manipulation by AC-EWOD-driven twin bubbles: (a) Initial state; (b) When twin bubbles actuated by AC-EWOD at a certain frequency (100 Hz) generate streaming, a micro-object is pushed by the streaming and transported to the next EWOD electrodes; (c) The object is carried by the sequential AC-EWOD operations with the twin bubbles to the right end of EWOD electrodes; (d) When the twin bubbles actuated by AC-EWOD at 1 Hz are transported to the original position without streaming, the object is released from the bubbles and remains where it is. Note that the bubble-induced streaming is generated only at a certain frequency. Schematic of an electrowetting-on-Dielectric (EWOD)-driven optical deflector : (a) Interface tilted in the left side; (b) Interface tilted in the right side by controlling the applied voltages on left and right walls. Schematic of an envisioned microfluidic mixing system using an alternating current electrowetting-on-dielectric (AC-EWOD)- driven mobile oscillating bubble: (a) Initial state; (b) When a voltage is applied to the top ground electrode and the bottom electrodes where a bubble sits, the bubble oscillates and simultaneously generates a microstreaming flow. Neighboring microparticles are stirred and mixed by the flow; (c) When the oscillating bubble is transported to the right by sequentially activating the array of EWOD electrodes, the microstreaming flow from the bubble is stirring and mixing microparticles through the entire microfluidic chip; (d) the initially gathered microparticles in the left side are widely spread over the entire area in the microfluidic chip. Schematic of micro-object manipulation using an untethered microrobot: (a) Initial state; (b) When an acoustic wave generated by a piezo-actuator excites a bubble attached on the bottom of a microrobot, the acoustically excited bubble generates a radiation force. Because of the radiation force, an neighboring object is pulled and captured to the bubble; (c) The captured object can be carried with the microrobot propelled by electromagnetic actuation to a desired place. Note that the piezo-actuator is still turned on to hold the captured object during the carrying operation; (d) When the microrobot reaches the desired place, the carried object is released from the bubble by turning the piezo-actuator off. This work has been selected for inculsion in IOP Select. Micro-object manipulation by acoustically exited identical twin bubbles: (a) Initial state; (b) When identical bubbles on the tips of a U-shaped rod are acoustically exited, they simultaneously oscillate and generate microstreaming, which, in turn, pushes an object; (c) The rod moves to the right, and the object is carried by the microstreaming; (d) The excitation is turned off and the rod moves to the left; the object is released from the bubbles and remains at its position.